Crane River Theater was created to serve the state of Nebraska and surrounding areas as a professional theater production company providing a home for the presentation, education and promotion of the arts. We provide the unique quality of using professionals from across the country and mixing them with area artists to create exciting and innovative productions. We have already had the honor of working with actors, directors and designers from thirty states, and are excited to share their talents with all of Nebraska. Backstage with Crane River Theater is an educational opportunity created to provide opportunities for high school students across the state to receive a backstage look at a professional production and take part in a series of theatrical workshops. The participating production for 2019 will be Newsies. 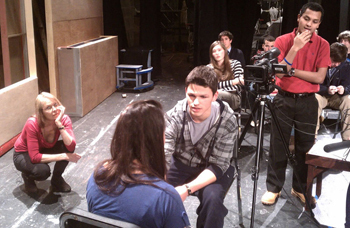 Available workshops will range from acting, musical theater and dance to video production and stage combat. We also offer workshops that focus on the technical side of theater which will include make up for the actor, directing, costume design and scene painting techniques. It is sure to be an invaluable experience for any student with an interest in the arts. 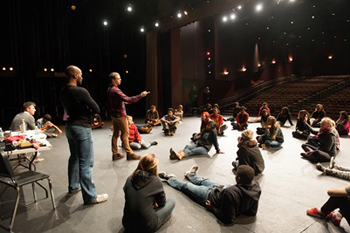 Explore the magic of theater through acting. This popular workshop will give participants a chance to get on their feet and develop characters. You will use interactive techniques to explore goals, obstacles and tactics as they apply to the world of characterization. It will also help you develop believable performances by finding the action that motivates relationships through emotional and physical strengths and using imagination in acting choices. 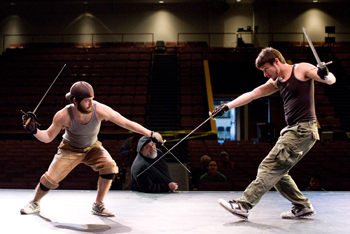 Want to know the basics of how to make a fight look real on stage? Students will learn how to successfully execute an unarmed fight with slaps, punches, kicks and more. Gain knowledge of how to trust your partner and fight safely, while incorporating motivation and characterization. Time permitting, students will also be introduced into basic sword fighting skills. This high-energy workshop will explore movement for musical theater, basic dance technique, sequencing and style. Participants will be led through an introductory warm up and then learn original choreography to excerpts from Broadway’s most popular shows. Previous dance training is not required. A good director must always tell a story. This workshop will empower the director with the tools to effectively communicate with actors and designers to create a unified vision that will translate the script to the stage. The rehearsal process is all about timing. It is important to allow time for creation and development, but the director must then focus that energy into a centralized concept that will allow the story to come to life. We will talk about various exercises that will foster character development and allow your actors to find the action behind the dialogue. *Faculty members and student directors are encouraged to take part. Find the playwright within yourself in this interactive workshop. Participants will explore the creative process and broaden their skills in storytelling. Bring forth your unique voice with a series of exercises that will reveal a roadmap to the wonders and revelations of the unconscious mind. Who doesn’t love to laugh? In this workshop, we will focus on the core skills of improv comedy in a fun and sociable way. You’ll learn a number of games that will help you develop scenes and create characters within seconds. We will spontaneously create theater through listening rather than thinking, from allowing rather than forcing, and from being fully present in the moment. Have you ever had a costume idea that you wanted to make a reality? This workshop will show you the process of developing your concept through character analysis and research, selecting the right fabric and pattern and eventually creating a drawing of your costume. Designers will discuss how to become inspired by costumes of the past and incorporate ideas into modern designs. Explore how to costume actors in a way that compliments the overall vision of the show. An advanced exploration of the musical theater voice and how to knowledgeably approach the music and lyrics of any song both as an actor and musician. Emphasis will be placed on producing a healthy sound with dynamics that have the emotional capability to move audiences. Participants are encouraged to bring a prepared song to be critiqued during the session. It all begins with the audition! Participants will be taken through the basics of any audition process, whether it be for your school musical, college scholarships, or professional opportunities. We will go step by step on how to choose material that showcases your strengths, perform your selections with confidence and believability, and ultimately land the part. This workshop is dedicated to the illusion of special effects as created by makeup for the stage. We will focus on the proper use and application of facial prosthetics, latex, and other make-up essentials necessary to create realistic bruises and wounds. Step-by-step instructions will guide you toward developing your own design. An emphasis on the proper way to apply and remove make-up will be part of this workshop, along with other basic makeup skills. Anyone with an interest in designing for the theater will benefit from this workshop. We will share with participants the essential elements of scenic, lighting and properties design. They will walk you through a step by step process of how to draft the set for your next production, light the stage in a way that conveys atmosphere and create realistic props to be used on stage by the actors in a way that compliments the overall vision of the show.